Senior Basketball tournament is a tournament designed in preparation for Senior qualify tournament at the end of the month. Referees and bench duty is very important development of this tournament besides the actual games. Well done to all the schools that provided referees. Students are required to understand the rules of bench and new referees learning what they are in for at the qualifying tournament. Senior Basketball has increased this year to 28 teams 2018. 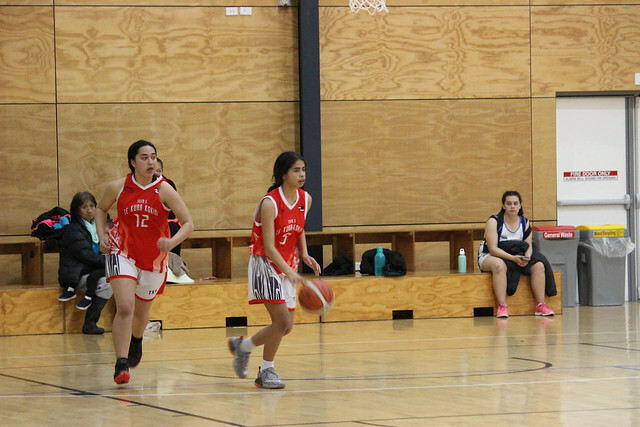 Last year we only had 19 teams, basketball is a growing sport in girls and boys in the bay of plenty . Action packed day with all courts jammed packed with exciting Senior talent. The boys premier grade (top boys grade) was won by Tauranga Boys College who were sharp and very skilled and displayed superior fitness. Division 1 Boys title was won by Te Kura Kokiri team who had some very tight games and displayed some explosive defence to take this title. The girls top grade was a tough exciting section with some very close results Rotorua Girls College pipping Tauranga Girls by one point to take the overall top trophy. Division 1 was won by John Paul College the girls displayed some good teamwork in defence and offence. Thank you to Tony Webster and Gee (TCBA) for picking all the MVPs and as the presenter for prize giving and to Cliff Horne and referee development you had a big task all day and finally to students from Toi Ohomai Robin and Jemma and Abbie Johnson from Otumoetai college without you this event would not have run smoothly.